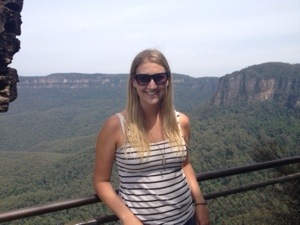 The day I visited the Blue Mountains was perfect! Sunshine, warmth, hardly a cloud in the sky: a rare occasion for me on this trip. 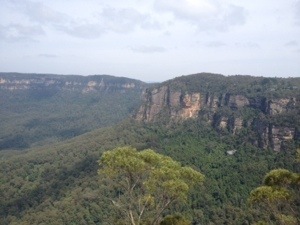 The two hour train to Katoomba went by in a flash and before I knew it I was wandering down the street towards Echo Point. There are a million tour buses at Katoomba station: organized groups, private tours or hop on/off buses. Unfortunately, by the time I reached Sydney my budget had worn thin and the 30 minute walk didn’t seem so bad! Approaching Echo Point was spectacular. Of course, there were thousands of tourists all milling about, but it didn’t take away from the breathtaking backdrop of the blue mountains. 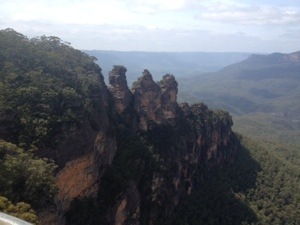 The Three Sisters are three rock outcroppings that stand straight up out of the mountain, side by side. It doesn’t sound like much, but set against such a beautiful backdrop in the Sunshine, they are wonderful to see. After some mandatory photos, I set off to find some hiking trails. The waterfalls were a two-hour hike one direction, but I figured I’d start with a 15 minute walk to the Three Sisters first. For such an easy walk, there weren’t many people on the trail. 15 minutes there and back?! How could you not check them out a little closer? A few minutes in I spotted the first one. It was covered by some trees, so I kept walking to get a better view. Still closer, the trees blocked me from any kind of a good shot, so I kept following the path down some stairs. “Uhhh…no,” he stammered “I don’t think so” then he looked up and saw that I was clearly joking. He thought that was hilarious and we became instant friends. Turns out Daniel was in Australia on a working visa and was in the middle of his three month of mandatory farm work up in Darwin. He had the most Australian job I could think of. No way. That is crazy! Apparently chicken heads are disgusting (and I don’t doubt it) but Daniel won for most random Australian job I’d heard of on my trip. So we chatted more about it as we continued down the stairs together. It wasn’t long before we came across a young girl from Brazil sitting on the side of the stairs. What? I thought this was a 15 minute round trip walk! What had I gotten myself in to? Great. We had already gone down 500 of them. So the three of us continued slowly down, in hopes that there was some other way out. When we neared the bottom, we ran into the Brazilian girl’s boyfriend. We all looked at each other… Nope. Too poor for that. Hiking back up the 900 steps it was! It was a long haul. And it made me realize how out of shape I am these days. My legs felt like jelly by the time the four of us clambered to the top. After that Daniel and I hiked the stunning trail to the waterfall. Unfortunately I was pressed for time and had to catch an early train back into Sydney so I could make it south to Cronulla for the night. But I walked 3/4 of the way to the falls before saying goodbye to my hilarious new friend and walking back toward Echo Point alone. I grabbed a quick lunch, hiked the 30 minutes back to the station and headed towards the city. 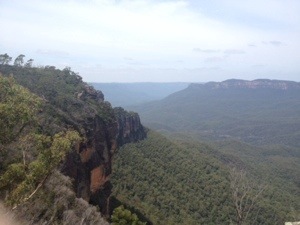 And even though my legs felt like death, it was a perfect Blue Mountain excursion! 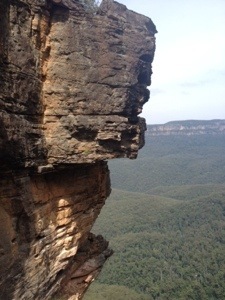 This entry was posted in Australia and tagged blue mountains, hiking, Travel by hilarylust. Bookmark the permalink. Another wonderful blog. Where is the energy coming, never mind the money? I know you know that all is well here, talked to the McDonalds this past week and rest assured they love the Copp house. There are slowly moving in and I guess deciding whether to re-construct or start anew. This week was fun for them, as we have been visited a pods of dolphins and Orca’s in pursuit.they went up to Squamish and then back down into Burrard Inlet. Our water indeed must be cleaning up. I am off to Palm Springs this week end for two weeks of sun and warmth.it is still pretty cool here. Aynsley & Carl are house sitting.hooray.and I think Cola might come to visit too.